Please note that we have made a few cosmetic changes to the Company profile. You will notice a new tab called “Billing Details” which pulls in a number of fields from the Company Details tab and includes a new field for “Invoice Preference”. For existing companies, the Invoice Preference will be defaulted to ‘per case’. When creating new companies, please ensure you still indicate on the Company Details tab whether it is a billing company. If not, then under Billing Details, you’ll need to select the appropriate company. All other relevant billing details should be completed on the new Billing Details tab. We are happy to announce that we have made a small enhancement to Immigo. Document Versioning is now available on documents in the Relationship tabs for both Companies and Suppliers in Immigo (previously it was available only on Applicant and Company Supporting Documents). Clicking “Back to Company” or “Back to Supplier” (or, on the Applicant tab, “Back to Applicant”) will take you back to the Company (or Supplier or Applicant) profile where you will see your document with the most recent version showing as available to click on to download. To look at previous versions, just go back to Step 1 – click Edit in the Version column. Have fun and let us know if you have questions! We are happy to advise the introduction of Rate Cards to Immigo! Rate Cards allow you to create and edit a group of professional fees that can be linked to multiple billing companies, with the additional ability to apply discounts or increases on a per-company basis. Fees listed on the Rate Card will now be available to select on Cases billing to that Company. We hope you find this upgrade useful! And remember, if you ever need any help, with this or anything else in Immigo, please call or email us – please keep the ideas and feedback coming! We are happy to inform you of some exciting new updates to Immigo! If your browser is set to Spanish, Immigo (and the client User Portal) will now appear in the Spanish language. This is to facilitate use of the client User Portal by Spanish speaking client contacts and applicants. Super User: This allows the Consultant to update all objects in the account e.g. Companies, Cases, Applicants and Users. Administrator: a Super User with the additional ability to set the roles of all Consultants in the account. Manager: has access only to the Companies (s)he is a Company Consultant for (listed within the Company). Can update any Case, Applicant and User where all Companies involved are under his/her management. Note that managers can see all the companies/cases/applicants listed but cannot open those to which they do not have access. Case Only Consultant: has access only to the Companies they are Company Consultants for. Can edit only those Cases (s)he is listed as a Case Consultant on, as well as Applicants and Users related to those Cases. Note that case only consultants can see all the companies/cases/applicants listed but cannot open those to which they do not have access. Staff User: can edit any Company, Case or Applicant in the account, but will have no access to confidential data, such as an Applicant’s personal documents, work and travel history, and other sensitive information (these tabs are completely hidden from the User). Inactive: Once a Consultant has been rendered Inactive, (s)he will no longer be able to log in to Immigo, and will be removed from all Cases and Companies (s)he is working on. By default, every user is identified as a Super User, which is equivalent to the previous ‘Consultant’ role. Please get in touch with your usual Peregrine contact if you wish to designate an Administrator who can set the permission levels of all of your Immigo users. In addition to the Permission Levels we have also introduced a Consultant Department function to identify a user as belonging to a particular department and thus to allow for easier reporting of activity in the system. New field: “Short Name” for use where a company has a nickname (for instance, “Australian National University” short name would be “ANU”). New Billing Address field: Where a company requests invoices to be sent to another of their locations, you may specify this under Billing Address. Please Ensure this other location is not a different legal entity, it must simply be a different office location to the Registered Address. Relationship tab: In addition to recording the Relationship Manager, you may add other Consultants who work on that Account. Filter: You may filter Applicants by Consultant (this will return applicants where you were the consultant on their open/closed cases). Sort function: You may sort the Applicant homepage via Immigration Status expiry date. These filter and sort functions will allow you to quickly identify those applicants with open cases that have upcoming expiry dates. Field: Applicant Tax Number (eg. TFN for Australia, RFC for Mexico etc). Customisable Cases Library homepage: There is a new “CUSTOMISE” button at the top of your Cases Library homepage which will allow you to select and deselect columns for your case homepage. You may also reorder these columns by dragging and dropping them around (similar to how the Report Field behaviour works). Extra columns: We have added two extra columns for “Total Invoiced” and “Total Uninvoiced”. Case Leader: You can now only list one case leader on a case (but can still list more than one consultant). 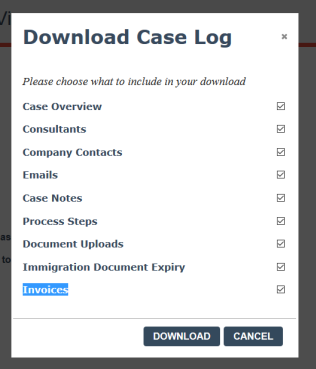 Company contacts: You can change the company contact who will receive the invoice for that particular case by selecting/deselecting the “Receives Invoices” tickbox. This will not change the selection at the Company Record level. Billing address: Ability to select the billing address from any address pre-listed in the Company Record. Emailing invoice: This is a big one! Immigo can now send your generated invoices (and credit notes) to the invoice contact from Immigo. Homepage filter: You may filter the reports by Report Type, Owner or Last edited. Cloning reports: When creating a new report, you can choose to clone from an existing report which will apply all filters and fields from a pre-created report. Consultants tab: Ability to assign a consultant as ‘Report Owner’ if you’re creating the report on behalf of someone else. Can then be used to filter homepage. Company/Case field: Company VAT Number and Company Short Name. Applicant/Case field: Applicant Tax Number. Choice case notes: Case note questions can now be a dropdown selection based on pre-loaded options. We are delighted to inform you of some exciting new features in Immigo! This special feature allows you to download a chronologically ordered PDF file of a case; pulling together case notes, process steps, uploaded documents and Outlook linked emails into a chronological timeline. You may find this log download useful for auditing, case management and escalation purposes. To use this feature, simply click on the new “Download Case Log” button at the top of the case next to the Edit and Save buttons. You can also include other sections of the case including Assignment Details, Invoicing etc (see options below). We hope you find this upgrade useful! And remember – if you ever need any help, with this or anything else in Immigo, please call or email us – we are always pleased to hear from you.